According to data culled from Deadbedbug.com and the New Jersey Department of Health and Senior Services (NJDHSS), the lifespan of bedbugs is about 10 months, which gives these tiny pests plenty of time to set up shop in your house. Bedbugs typically find their way into households via contact with other people, pets, sleeping bags and other camping equipment. Antique collectors may innocently cause bedbug infestations by bringing old furniture and books – one of several cubbyholes for bedbugs – into their homes. Part of what makes bedbugs so difficult to detect until after they have begun to feed on your blood is their size. 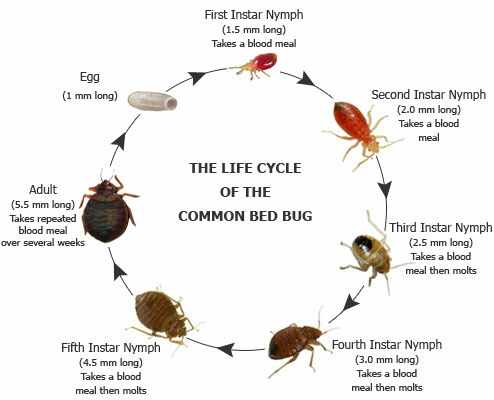 During its ten-month life span, a bedbug goes through five stages called “nymph stages” before it becomes a bona-fide adult. An adult bedbug is 5.5 mm long (less than an inch), and their eggs are an almost microscopic 1 mm in length. Bedbugs do bite, unfortunately, feeding on human blood. Even worse, a female bedbug lays hundreds of eggs at a time, and as many as five eggs per day in perpetuity. While this is a scary reality, there is light at the end of this tunnel. As of the date of this article, there is no history of bedbugs carrying diseases. At most, bedbugs may cause mild allergic reactions due to components in their saliva. Bedbug bites are painless and show up on human skin in the form of small red welts that may itch, but there have been no reports of more advanced wounds. There are basically two options when it comes to ridding yourself of bedbugs: do-it-yourself methods and hiring a professional exterminator. If you chose the former option, there are popular eco-friendly sanitizers that can be used, such as the Clean Wave vacuum by Verilux. Clean Wave uses UV light to kill bedbugs and unhatched eggs.